Hi, I am interested in your 1965 Shelby Cobra (stock #4750-CHA) listed on Autotrader for $34,995. I'd like to get more information about this vehicle and confirm its availability. 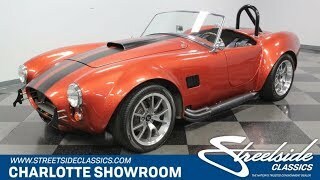 A powerful fuel-injected V8, unique paint, and mileage so low that this only need the first column in the odometer so yes, this 1965 Shelby Cobra by Factory Five is that serious performance machine built to standout in any crowd. The paint on this one tells a very cool story. Its a shade of Go Mango used on the Viper SRT10, and that car was first envisioned to be a modern-day Shelby Cobra. So to have a fresh replica build (completed earlier this year and only 2 miles on the odometer) carry this modern color seems like the right kind of family connection. More than just a great story, this deep metallic orange looks terrific as the gloss helps highlight the flared curves of the legendary Cobra design. The distinctive matte black stripe package has been painted on correctly, and you see it in how it fully encompasses the car including below the front intake, under the hood crease, and into the cabin. Those stripes need to be this complete, because they go with all the other dark details like the quick jack racing bumpers, roll hoop, and side pipes. And because a Cobra is meant to be open to the world, the interior continues this aggressive black look to coordinate with the exterior accents. This has all the right Cobra pieces, like the wood grain steering wheel, forward slanting gear stick, and a full set of gauges including the correct reversed speedometer. Plus, you have a pair of racing bucket seats with Simpson five-point harnesses. So this roadster is ready to get down to speedy business. Its always great to see a Ford V8 under the hoods of Cobra, and this one takes the legend into the modern era. This is a 5.0L fuel-injected motor, and it has been rebuilt for reliable fun. So you have a powerful motor that has been fortified to handle powerful driving. You get to enjoy the high-octane soundtrack this creates with the header-fed growling side pipes. Best of all, you are the conductor of this symphony with the strong TKO500 five-speed manual transmission. Whether on the street or the track, youll appreciate features like the tubular A-arm front suspension, SVO rear suspension, power steering, front disc brakes, and the grip of modern ZR-rated tires. Complete with title documentation, this is a distinct, powerful, and absolutely fresh Cobra. You already know what kind of value this one is, so dont miss your chance. Call now!